According to the Chinese Zodiac, this is the Year of the Rabbit. Unfortunately, many misguided people are using this as a reason to adopt rabbits and then, not realizing they are companion animals with specific needs, dumping them on local shelters. Learn more about rabbit care by visiting with Frederick’s local chapter of the House Rabbit Society, on Saturday mornings from 10 a.m. to noon at the Frederick County Humane Society. For more information contact FCHS at 301-634-8300. 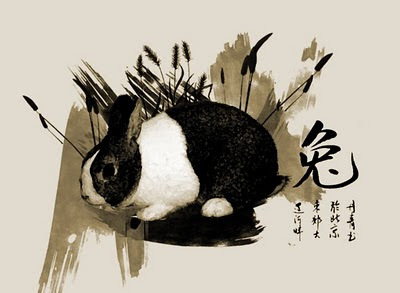 This entry was posted in FCHS, House Rabbit Society on March 27, 2011 by yourfriends. The donors for the EVBB are pet dogs from every walk of life. 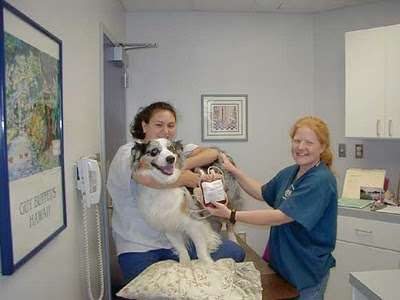 These canine heros are called upon every 2 months donate blood. Each contribution is processed into blood products that can aid up to 4 dogs in need. Donors must weigh at least 35 pounds and be between the ages of 9 months and 7 years and be available to donate 4 – 6 times a year and commit to donating for at least one year. As a benefit, donors will receive annual blood tests for heartworm disease, chemistry panels and complete blood counts to help monitor their health. In addition, should donors ever require a transfusion, they will receive a free unit of blood or plasma for each unit donated. Of course, each time dogs donate they receive lots of biscuits and plenty of TLC. This entry was posted in Blood donation, community, EVBB on March 20, 2011 by yourfriends. Skin conditions vary in their presentation and severity in our cats and dogs and can be chronic and very frustrating. We are so glad to be able to offer a new product line to our clients which we feel supersedes many of medicine’s previous approaches to topical skin support. Douxo is a product line that is produced by a company called Sogeval. This veterinary line was introduced to the US market in 2006 but prior to that was being used in Europe with good success to support a variety of different skin ailments. The common thread in almost all of the products in this line is a molecule called phytosphingosine. It is a naturally occurring molecule in the outermost layer of the skin that has anti-inflammatory, anti-bacterial, anti-fungal properties as well as controlling excess oil production and crusting and scaling of the skin. This line of shampoos, sprays and spot ons carry supportive levels of phytosphingosines to help replenish this building block in the skin when there is a break down in the skins integrity. This entry was posted in Douxo Shampoo, New Products on March 13, 2011 by yourfriends. First the famous cartoon dogs, now some of cartoon cat’s famous faces! Arlene is Garfield’s lady friend and one of the only ones in his comic that can match his wit. The big gap between her two front teeth give her all the personality she needs. Perhaps a lesser known cartoon cat, Azrael is Gargamel’s partner in crime as he plots to destroy the gleefully blue smurfs. Bill doesn’t say much, due to the fact that he has a bit of a hairball problem. He is best known for making his noises at Opus in Bloom County. Bucky is an angry siamese cat with a razor sharp wit. He’s usually the smartest guy in the room and never lets the dog forget it in the Get Fuzzy comicstrip. 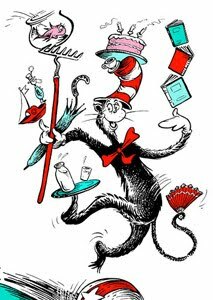 Probably the most charismatic character of the Dr. Seuss books, the Cat in the Hat teaches us all to enjoy the ride. Perhaps the best part of Alice in Wonderland is the smarmy Cheshire Cat offering his brand of frustratingly useless advice. This is one cat that doesn’t take life laying down, Felix the Cat is always up for a good laugh. Maybe one of the most widely known cat cartoon, Garfield is one cat with attitude. He isn’t interested in much, except lasagna, napping, lasagna, teasing the dog, oh, and did we mention lasagna? The neighborhood bully Heathcliff manages to live up to his name. He keeps the neighborhood dogs guessing & always has time for a little romance. The flagship character for Sanrio, Hello Kitty doesn’t say much, but her face pops up everywhere we look. What Hobbes is depends on whose perspective you prefer. To Calvin, Hobbes is a playmate & confidant – to everyone else Hobbes is a stuffed tiger. Probably everyone has felt a little sympathy for poor Penelope as she is smothered in stinky kisses by none other than Pepe le Pew. The king of cool, Pink Panther started out as part of a title sequence and wound up becoming the most recognizable pink kitty in town. This character comes from a French fable about a man who inherits an extraordinary cat (with a boot fetish no less) who has a plan for his unsuspecting master. Little Sagwa is as sweet as she is cute. From the show named after her, Sagwa keeps us entertained as she learns from her own mistakes. Bart & Lisa’s favorite show on The Simpsons, The Itchy & Scratchy Show pits cat & mouse against each other in a bloody statement about modern cartoons. Probably good friends with Bill the Cat, Snowball is best known for her hairballs and her random involvement in one of The Simpson’s latest schemes. Definitely the dumbest cat on this page, Stimpy is not the sharpest tool in the shed. But he’s got to be pretty dim to share in Ren’s hair brained schemes. With a catch phrase like “Thuffering Thuccotash” you wouldn’t believe Sylvester was bright, but we think he doesn’t really want to catch Tweety Bird. Definitely the most exciting member of Winnie the Pooh’s gang, Tigger is almost obnoxiously energetic. Much like Sylvester, we think maybe Tom isn’t as interested in catching Jerry as he would have us believe. This entry was posted in cartoon cats, famous cats on March 6, 2011 by yourfriends.